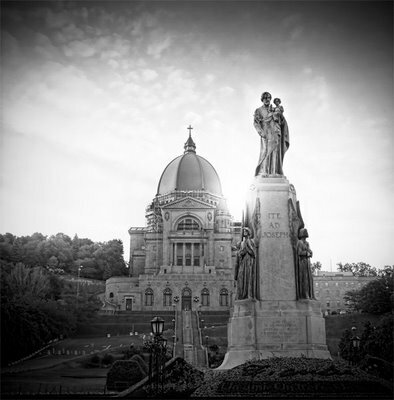 As our viewers know, Salt + Light Television presents a French daily Mass live from St. Joseph's Oratory Crypt Church at 8:30am ET. This Thursday afternoon, December 30th, Salt + Light will present an additional Mass. Catholic Christian Outreach, CCO, is holding their annual young adult conference Rise Up in Montreal this year. Appropriately, Canada's newest saint, Brother André, will be a focal point for this year's conference. Many miracles were worked through him, but he always remained humble saying to those who came to him for healing "I am only a man, just like you." That quote, in fact, is the theme of Rise Up 2010. Hundreds of young people will gather together to encounter God, and learn how God can work through them when we give Him our 'yes'. You can learn more about CCO and Rise Up 2010 here. As part of the conference, participants will be traveling to the Oratory for Mass on Thursday afternoon. Join us for this very special live presentation of Mass from the Oratory, on December 30th, at 2:00pm ET. Mass will be bilingual, and will be celebrated by Bishop Paul-André Durocher, the head of the Diocese of Alexandria-Cornwall.